Republicans Assure Us That Trump's Not Firing Mueller, Why Do You Ask? Charting more territory of unexplored crazy: lawmakers and journalists are speculating that Attorney General Jeff Sessions’s decision to fire FBI Deputy Director Andrew McCabe is signaling an effort by the Trump administration to get rid of special counsel Robert Mueller. 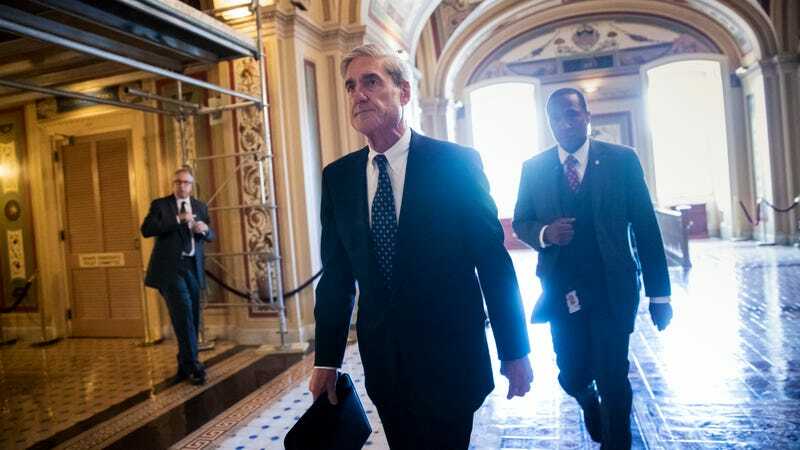 The topic has largely been avoided because it’s too outwardly corrupt, but this week, the special counsel subpoenaed the Trump Organization, and Trump has been tweeting in ALL CAPS about how there is NO COLLUSION, and this is a WITCH HUNT!, naming Mueller now, explicitly. Yesterday Trump’s lawyer John Dowd told the Daily Beast that he hopes that Deputy Attorney General Rod Rosenstein will end the probe, and then he quoted Tennessee Williams. THIS IS THE POISED OPTIMISTIC TONE OF A MAN FULLY CONFIDENT IN HIS INNOCENCE. “If you have an innocent client, Mr. Dowd, act like it,” Representative Trey Gowdy (R-South Carolina) on the House Intelligence Committee told “Fox News Sunday.” Growdy said Dowd “does [Trump] a disservice” when he says that the probe should be ended. He said that Trump should let the special counsel do his job, and Trump should do his own. As the Washington Post has explained, firing Mueller is not within Trump’s purview; since Attorney General Jeff Sessions has recused himself from the probe, that power would fall to Deputy Attorney General Rod Rosenstein, which Rosenstein has said he does not have cause to do, but Trump could fire Rosenstein. “I think it’s very important that he be allowed to do his job without interference, and there are many Republicans who share my view,” he added. AND THEN WE CAN ALL STOP SCREAMING.